Starting from Chiang Mai, your driver will bring you 3.5 hours north to the laidback town of Pai. This scenic route winds through over 700 twists and turns in the rolling green mountains and tropical forests of northern Thailand. You'll break for lunch when you arrive in Pai, where you'll stay for the first night of the trip. Spend the afternoon exploring this backpacker's haven, full of cute cafes, a vibrant market and fantastic nightlife. 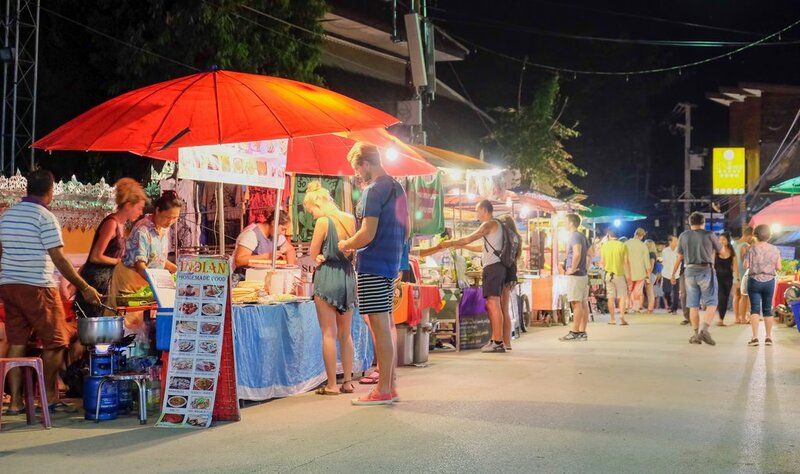 You'll find a huge array of street food from all different cuisines, as well as super-healthy options for those looking for raw, vegan, or gluten-free fare. 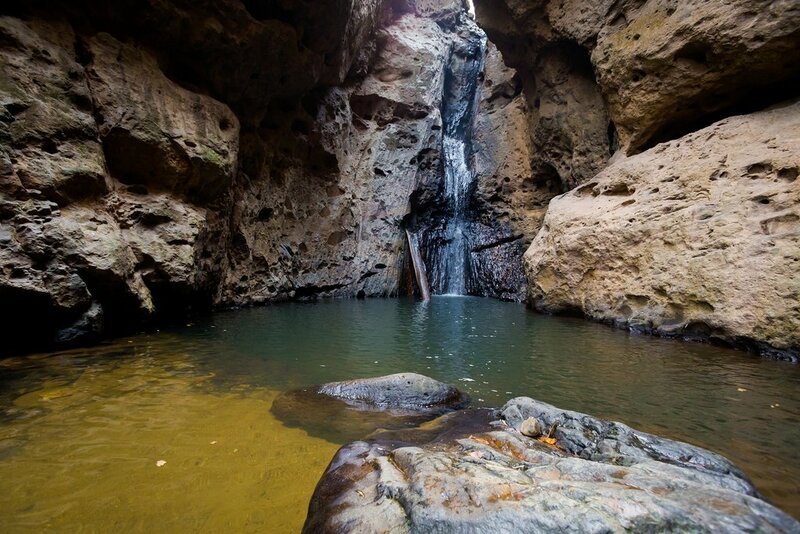 If you're feeling adventurous, rent a motorbike and visit some of the beautiful surrounding waterfalls and hot springs, or hike the steep, but rewarding trails of Pai Canyon. A guided trek can be arranged, if you prefer. Get right on the water today for the first day of a thrilling two-day guided rafting excursion. 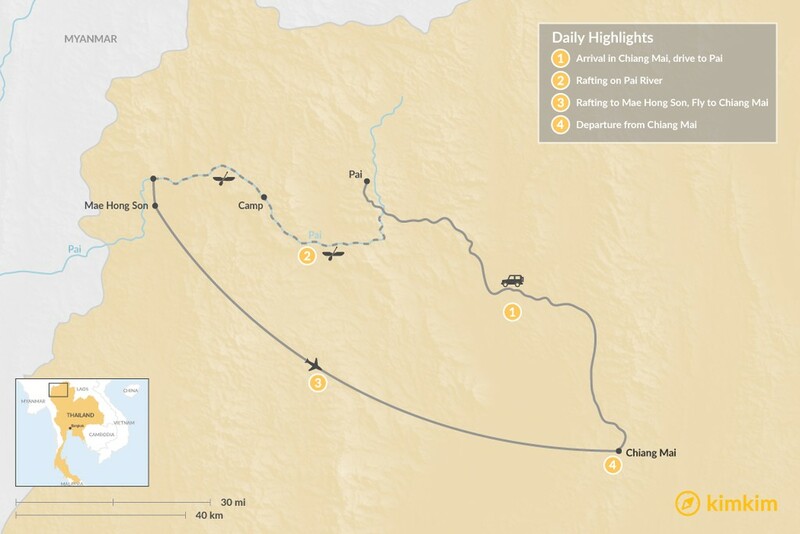 After coffee and breakfast, you'll travel from Pai to the starting point on the river. Following a safety briefing, board the raft and make your way west on the Pai River through the lush jungle. The current will start off gentle, but you'll soon hit wild, bouncing rapids. 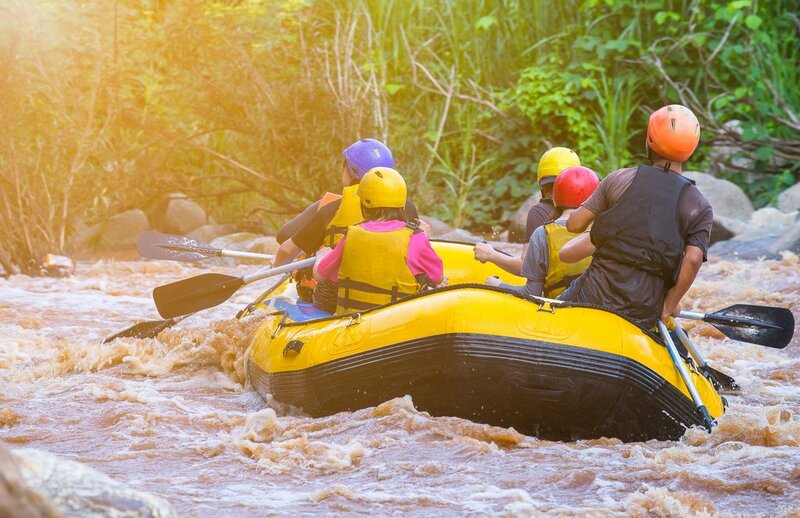 Break for a picnic lunch under a tropical mango tree, then get your adrenaline pumping again as you take on churning Class IV (advanced) rapids, the most challenging of the trip. You'll come to some hot springs and a fluoride mine, eventually stopping to swim and relax in a small waterfall pool. 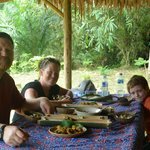 Spend the night at a bamboo jungle camp, where you'll enjoy a welcome drink and a delicious home-cooked meal over a wood fire. Relax in your hut or tent amid the sounds of nature for the night. This morning you'll get back on your raft after breakfast and continue down the middle fork of the Pai River. Paddle until you reach the Khong River junction, where you'll stop and take a relaxing dip in the hot springs and a detoxifying mud-bath. From there you'll continue to a clear stream, where you'll have a picnic lunch before tackling some more lively rapids along the Pai gorges. Later on you'll paddle through a farming region in the Mae Hong Son Valley, where you'll end your rafting trip in a nature reserve in the mid-afternoon. 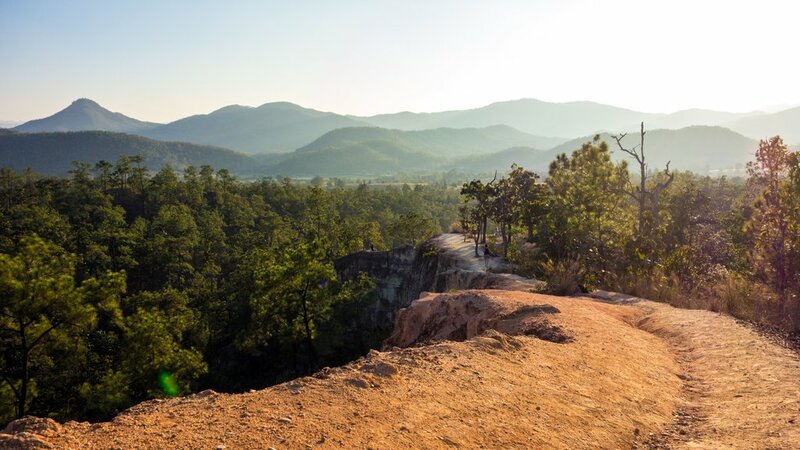 After rinsing off and collecting your belongings, you'll drive to the town of Mae Hong Son, near the Burmese border. If there is enough time, stop by the lake in the center of town and admire its stunning white and gold Shan temple. Then head to the airport for a quick domestic flight back to Chiang Mai, northern Thailand's largest city. Today you'll conquer Doi Suthep Mountain. This hike is an easy one, with rolling terrain along a ridge covered in pine trees and wildflowers. Halfway to the top, stop in at a Hmong village. The Hmong people are one of Thailand's many hill tribes that populate this mountain area. Sip on some locally-produced coffee with locals, and learn about their culture and traditions. From there you'll trek downhill to the magnificent 800-year-old Doi Suthep temple. 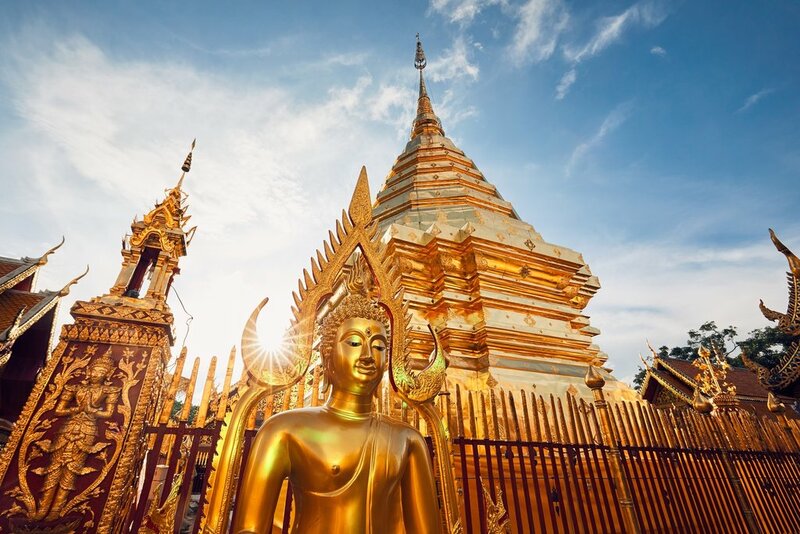 The golden Buddhist wat is sacred to many Thai people, and offers sweeping views of Chiang Mai in the valley below. In the afternoon you'll return to Chiang Mai, where you can spend your last night immersing yourself in the local cuisine. Fill up on khao soi (a tangy, spicy curry soup), lemongrass-stuffed rotisserie chicken, or if you're feeling adventurous, try boat noodles, a popular pho-like street food with an intense, pork blood broth. Then head to the airport for your onward flight, or stay on in Chiang Mai for further adventures. Both the one day tour and the longer tour were very good. The one day tour suffered from going to two very touristy spots with a long drive for one day. I think it would be more advisable to recommend closer experiences if possible for a one day trip. The guide Bom was excellent. 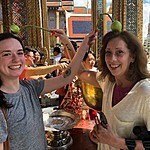 The guide for the longer trip Apple was very personable, friendly and helpful but we did feel at times that her English language skills were below par particularly in vocabulary and fluency in passing on information eg the history of an area. The content of the trip was on the whole very good though could have been a little more imaginative in some areas - we found that we consulted our Lonely Planet guidebook regularly eg for hints on good museums, other sites not on the itinerary. For instance the Sukhothai Museum turned out to be excellent for those interested in the local history , we also found a very interesting ceramic workshop which ran interesting tours . A range of additional things should be able to be suggested by a good guide. Sukhothai was a highlight for us particularly as the Loy Krathong festival was so brilliant with the illuminated historical site - a piece of info which was not included in our itinerary nor particularly emphasised by the guide. The Loy Krathong dinner which we attended in Chiang Mai hotel was fine though somewhat overrated (and artificial compared to Sukhothai event) . It would have be useful to know we were paying such a large amount for that particular event - the buffet food was definitely not memorable. Also I may have missed it in info provided but it would be good to have some guidance on tipping (for guides/drivers) in Thailand as each country has been different approach to this.